Policymakers and educators have long puzzled over why more students do not pursue STEM majors in college, even though those who have an undergraduate degree in a STEM field of study earn more than those with other college majors – regardless of whether they work in a STEM job or a different occupation. 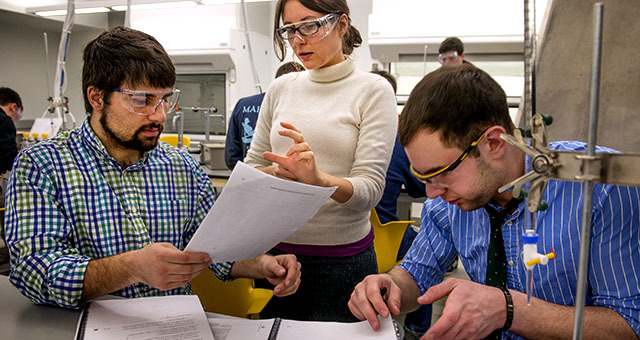 Yet only a third of workers (33%) ages 25 and older with at least a bachelor’s degree have an undergraduate degree in a STEM field, according to a new Pew Research Center analysis. Smaller shares say the main reason more young people don’t pursue degrees in STEM is that they think STEM subjects are not useful for their careers (23%) or they think these subjects are too boring (12%). A 2013 Pew Research Center survey, using similar question wording, found that Americans were also most likely to point to the difficulty of science and math as the main reason more young people don’t pursue degrees in these fields. In the new Center survey, Americans with a college degree or more education are more likely than those with less education to say the main reason is that young people think STEM subjects are too hard (63% vs. 46%). Those without a college degree are about twice as likely as college graduates to say the main reason young people don’t pursue a degree in a STEM field is that they think these subjects are not useful for their careers (27% vs. 13%). Only 13% of the U.S. workforce was employed in STEM occupations as of 2016, while the vast majority (87%) was employed in other occupations. Even so, four-in-ten of those non-STEM workers (40%) say they were at least somewhat interested in pursuing a STEM job or career at some point in their lives. The survey asked those non-STEM workers why they did not end up pursuing this interest. The most commonly cited reason for not pursuing a STEM career was cost and time barriers (27%), such as high expenses required for education or a lack of access to resources and opportunities. 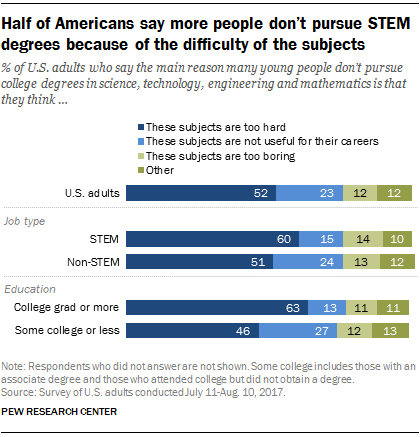 One-in-five (20%) say the reason they did not pursue a STEM career is they found another interest, while 14% say they found STEM classes were too hard or they lost interest. 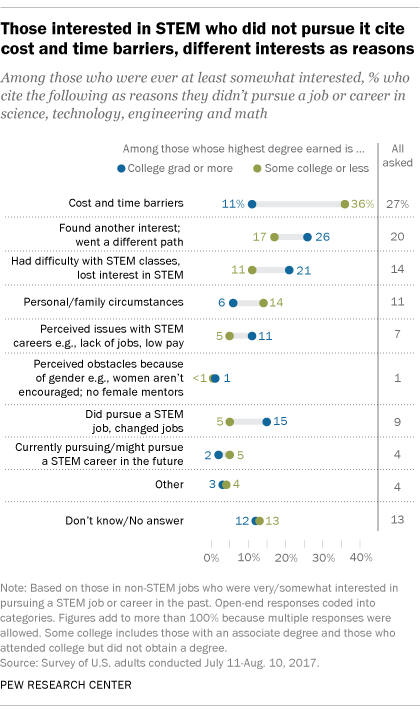 There are differences between those with and without a college degree in reasons cited for not pursuing a career in STEM. Those with some college or less education are about three times more likely than college graduates to cite cost or time barriers (36% vs. 11%), while college graduates are more inclined to say they found another interest (26% vs. 17%) or found STEM classes too difficult or lost interest in the subject (21% vs. 11%). Brian Kennedy is a research associate focusing on science and society at Pew Research Center. Cary Funk is director of science and society research at Pew Research Center.